Emerald comes primarily from South America and Africa. Columbian emeralds have long been considered the best but Africa also produces beautiful emeralds. Tanzanite is also and African gem species and occurs in rich, velvety shades of violet and blue, sometimes mimicking the color of fine sapphire. 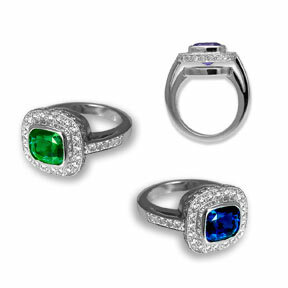 Emerald and tanzanite are softer gem species, beautiful to wear but more vulnerable to chipping and scratching. I handle both South American and African emerald and tanzanite and recommend it especially for pendants and earrings. I can help you to select a colored gemstone to suit your taste and your budget. Together we can design a piece of jewelry that you will treasure for a lifetime. Call Laura Powers Jewelry at (404) 233-9841 for high quality Colored Stone Jewelry, which is perfect for your Engagement or Wedding occasion.